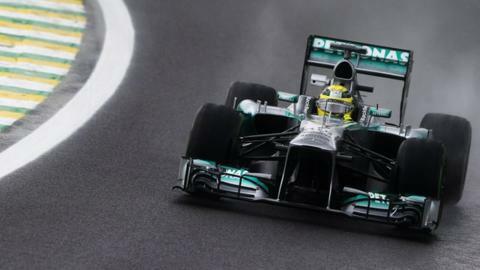 Mercedes driver Nico Rosberg beat the Red Bulls in a wet second practice session at the Brazilian Grand Prix. The German, who also was 0.225 seconds ahead of world champion Sebastian Vettel and his team-mate Mark Webber. Lotus driver Heikki Kovalainen was fourth, ahead of Rosberg's team-mate Lewis Hamilton, who had a spin and was 0.841secs off the pace. Force India's Paul Di Resta was 13th and McLaren's Jenson Button 22nd. Rosberg was fastest both on full wet-weather tyres early in the session and on the 'intermediates' in slightly drier conditions later on. He and Mercedes appear to be in good shape if qualifying on Saturday and the race on Sunday are also wet, as weather forecasts suggests they may be. "I had a good start into the weekend, and I was very quick in the rain even though we don't really know about the fuel levels of the other teams," said Rosberg. "Therefore we need to read the time sheets with some caution. But generally I have higher hopes now that perhaps we can give Red Bull a hard time this weekend." Hamilton, though, was struggling to keep pace with his team-mate, lagging behind in both the first and second sessions. His struggles were underlined when he lost control as he put the power down on the exit of Turn Four. The spin came on his first proper lap in the second session after he sat out the early running following a heavy shower. Rosberg ended up 0.225secs faster than Vettel, who this weekend is trying to equal the all-time record of nine consecutive F1 world championship wins. Webber, who is driving in his last race before leaving F1 after a 12-year career, was just 0.061secs behind Vettel as he prepared for a race that he hopes will make him the only man in history to win his final grand prix. Toro Rosso's Jean-Eric Vergne was typically impressive in the wet by setting sixth fastest time, ahead of Felipe Massa, whose eight-year career at Ferrari will come to a close after this race. The Brazilian is moving to Williams next season after Ferrari decided to sign Kimi Raikkonen instead. Sauber's Nico Hulkenberg, who led this race in the wet for Force India last year, was eighth fastest, ahead of Toro Rosso's Daniel Ricciardo and Lotus's Romain Grosjean. Ferrari's Fernando Alonso, who secured second in the championship behind Vettel at the US Grand Prix last weekend, was 11th, curtailing his running just before the driest part of the session right at the end. The wet weather meant the teams were not able to run the development tyres taken to Brazil by supplier Pirelli, which is trying to amass data ahead of a major change in chassis and engine regulations next season. Vettel said: "People didn't run a lot this afternoon because they want to save their tyres as we only have one set for free basically to use today, so it is a bit of shame for the people who went out on the grandstands but unfortunately it is like this - come Saturday and Sunday you need to have the tyres and be sharp and make the right calls. "We just tried to baseline the car and see how it was. When you reach a point when there is too much water, it is very difficult to run in these cars. "The main loss is we didn't run on the 2014 tyres. We were hoping for a bit of running on those but it didn't happen." The rules restrict teams to four sets of 'intermediate' tyres and three sets of 'extreme wets' per grand prix weekend, but drivers have an extra set of intermediates they can use on Fridays and give back without affecting their allocation. See full second practice result.